Note: Winner of 4 in a row including the Nashua and Remsen Stakes last year. 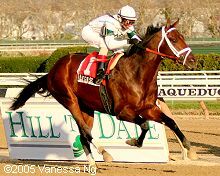 Won his 2006 debut in the Sam F. Davis Stakes at Tampa Bay Downs in stakes record time. Was less impressive in the Tampa Bay Derby, running 2nd by 2 lengths to Deputy Glitters but did lose a shoe in the race. Was a disappointing 4th as the favorite in the Blue Grass for his final prep, tiring at the end. Made a good late move in the Derby to get 2nd behind Barbaro. Skipping the Preakness to go direct to the Belmont.